WHISKAS ® PERFECT PORTIONS™ Cuts in Gravy Chicken, Turkey, Salmon & Tuna Selections 24pk is rated 4.7 out of 5 by 63. Rated 5 out of 5 by VICKIGNS_349428384 from We have two cats ( Tiger and Smokey) that are are about 1 1/2 rears old:) They used to like any variety of wet food and somewhere down the line that changed. They became very finicky with and I was having a hard time finding a food that they both liked. I had never tried Whiskas Perfect Portions before until I picked up my sample that I received the coupon for from you. I'm very happy to say that they both love all of the flavors and I no longer have to waste my money trying different ones with them any more:) They are in pretty much every store and are very reasinably priced even when not on sale:)Thank youi!! 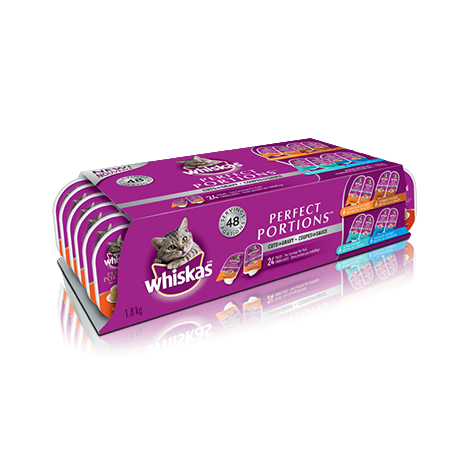 Rated 5 out of 5 by AMYYON_349455720 from WHISKAS perfect portion is great because it is super convenient for me, and delicious for my pet. My cat can finish the food in one serving, no need to store leftovers in the fridge and no mess to clean up! I also like how the variety pack has several different flavours, providing some change in taste once in a while. WHISKAS wet food is hight in moisture and easy to digest, occasionally I will mix it with some dry food or unseasoned turkey meat for a special treat! Overall, I (my cat) really enjoyed trying wet cat food and will likely purchase another pack in the future. Rated 5 out of 5 by JASONPON_349455598 from We have two cats and both enjoyed Whiskas Perfect Portions. I mostly liked the fact that there is no smelly leftovers in the dish sitting around. The variety pack was great idea in that they did not become bored with the same meal each night. Having the individual meal portions makes sense and there is no chance in overfeeding. Very good new product and I will continue to purchase. Thank you for the sample, it is now their new favorite. Rated 5 out of 5 by LAURABNL_349465836 from My cats love soft food and they loved these very much. I found that they both enjoyed every flavor included in this box and I love how they come in perfect portions. I love the feeling of giving my cats fresh food every time I feed them. This food never lasted long once I placed it in their bowls. I have changed to this cat food permanently and overall I think it's a great product of high quality with a fantastic packaging idea! Rated 5 out of 5 by BARBPAB_349465663 from Each of my 3 cats gobbled it up! I have one cat with a delicate stomach and he ate it as well and no vomiting! I like the portion packing since my other 2 cats are rather heavy so easier to control their portion! Only thing is I find the cover somewhat hard to peal off and sometimes get sprayed with gravy. I felt the price was reasonable for this product. Rated 5 out of 5 by ANN_DON_349454377 from Great coupon offer, thanks SampleSource and Whiskas! Our cat loves this food, especially the gravy! It is a perfect portion size, and easily recyclable, which I like. The tuna didn't go over the best with our furry friend, but that's normal for him (strange, I know). I would definitely recommend this product to other cat owners. Rated 5 out of 5 by AMBERBMB_349457136 from As soon as I opened the wet cat food up my cats noises started to move and then they started to go crazy, by pawing and meowing at me, even the dog wanted it. Lol the cats also watched where I put the rest and would sit near it and meow at the kids and me so I would definitely buy this again for my cats. Rated 5 out of 5 by JESSMNB_349459011 from This is a great product! I hadn't bought it before, but I had purchased the other foil topped Whiskas with the lid. My cat loves this stuff! And I love that it is serving sized! Thank you for this opportunity Whiskas! I will definitely buy this when our sample pack is finished! WHISKAS® PERFECT PORTIONS™ Cuts in Gravy is formulated to meet the nutritional levels established by the AAFCO Cat Food Nutrient Profiles for all life stages. WHISKAS® PERFECT PORTIONS® Cuts in Gravy Chicken Entree is formulated to meet the nutritional levels established by the AAFCO Cat Food Nutrient Profiles for all life stages. WHISKAS® PERFECT PORTIONS® cuts in gravy Turkey Entrée is formulated to meet the nutritional levels established by the AAFCO Cat Food Nutrient Profiles for all life stages.